You are here: Home / Guilds/Fairs / Community / Atlantic Antic Take-away: Not Just Memories, Free Bike Helmets! Atlantic Antic Take-away: Not Just Memories, Free Bike Helmets! 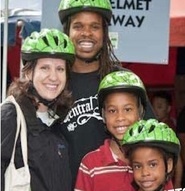 KUDOS TO COUNCIL MEMBER STEPHEN LEVIN and the NYC Department of Transportation for the bike helmet giveaway Sunday, putting a safety spin on the exhuberant rain-or-shine fair. Expert fittings and how-to helmet info went with the free helmets for kids and grownups – advance prep for the ambitious bike share system. Citi Bike launch is now set for March, 2013, when 7000 of the eventual 10,000 bikes are to be deployed to 420 stations. It’s to cover parts of Manhattan, Long Island City and Brooklyn, and will run with solar-powered circuit boards and software.